How am I in the third trimester already? I can’t believe he will be here in less than 10 weeks! By the way, props to Blaire for taking this pics (without showing herself in the mirror!) We may have taken 200 pictures to make sure, but she’s come a long way and is mommy’s biggest helper! 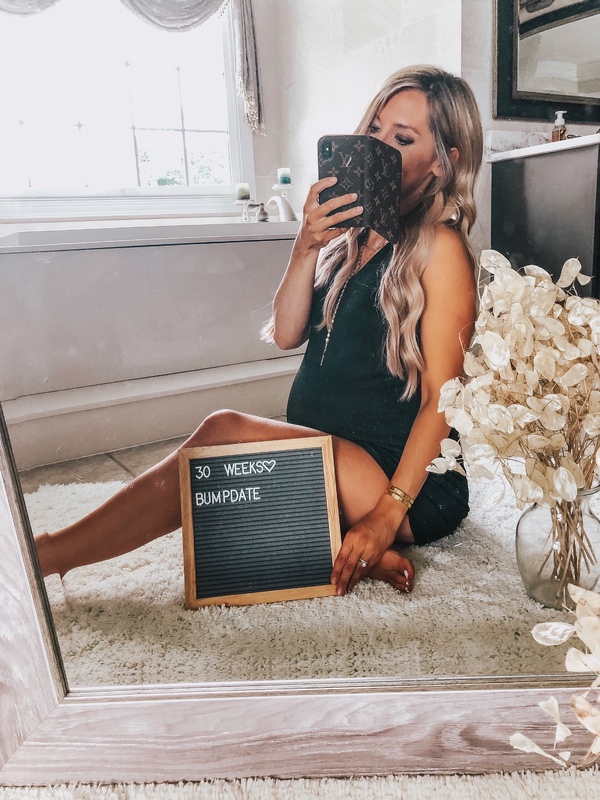 I haven’t done a bumpdate in a long time, mostly because I barely have time to even think about this pregnancy with two other kids! But also because it’s been fairly easy, other than the constant exhaustion and heartburn. What’s New: If you saw my stories a couple weeks ago, I finally took the glucose test! Thankfully I passed the initial test (I didn’t with Blaire, and the 3 hour test is no fun!) so I’m so happy about that! I also started to develop some terrible acid reflux, which if you’ve had you know can be really painful and uncomfortable. I’ve gotten heartburn with all of them, but this time came later and much more intense. Tums have never really worked for me, so my doctor allowed an over the counter heartburn medication that I would highly recommend asking your doctor about if you’re experiencing it too! As long as I remember to take it every day, I don’t have any symptoms anymore. One other thing is my nausea is coming back a little bit. I haven’t been getting sick my I will feel queasy and not well about an hour later on in the day. I’m having a ton of Braxton Hicks! Theres so much tightening, and sometimes it gets pretty uncomfortable. He also kicks me most of the night like Brooklyn did, and forbids me from sleeping on my back! Is it just me or should pregnancy allow as much comfort and sleep as possible, so you’re rested and in your best shape for when the baby comes??? lol. I’m going every two weeks now, and scheduled my last ultrasound to see the baby’s size. I’ll be having another scheduled c-section (as long as everything goes to plan) so my doctor likes to make sure we are scheduling the birth at a good size and weight for the baby. What I’m Wearing: Lots of people ask if I’m wearing maternity clothes yet, and I’m not really sure what that means! I have a few maternity pieces that I do love, but honestly I wear what I like and what I feel good in. 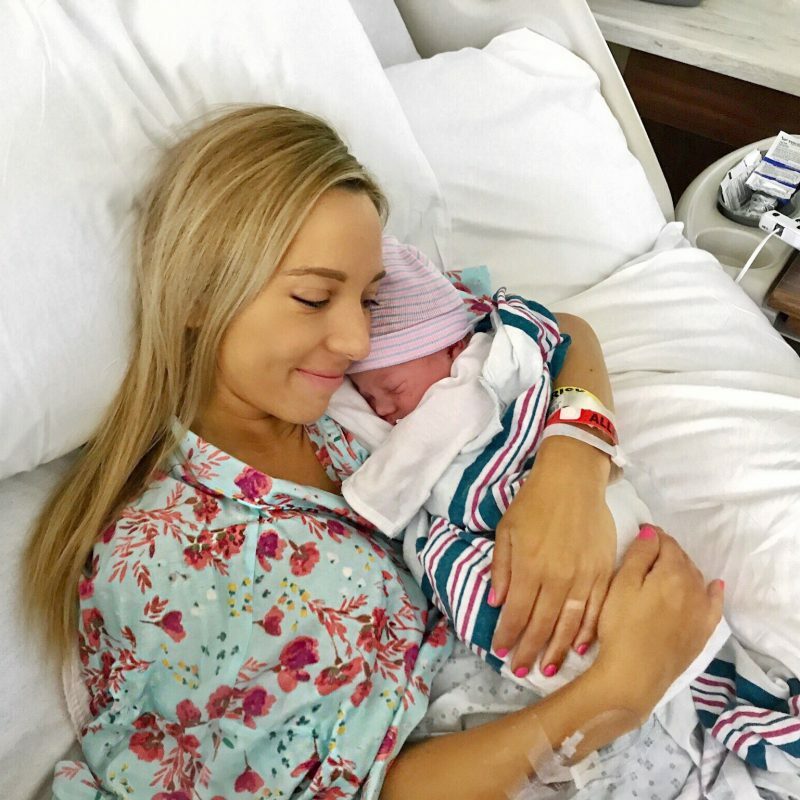 I would say other than a few basics or fun pieces the majority of my wardrobe is non-maternity and I always share that on my instagram or on this section of my blog. With all of my pregnancies I’ve just sized up a size or two do get the comfort and fit that I want, without having to sacrifice comfort and style and it’s always worked well for me. Free People is really maternity friendly in my opinion because everything they make is typically already oversized! When I do wear maternity clothes, these are by far my favorite brands and stores to shop at! Workout / Eating: I have gotten a few questions how I stay fit during pregnancy, what I’m doing & what I’m eating. Which honestly, I love you guys because I could not feel less “fit” right now! While everything is on track with growth and weight gain, I am definitely carrying this baby a lot differently than my girls. My doctor said you tend to carry lower & show faster with each child, which could not be more true! This baby is super low and a lot of times I feel like I should be holding up my belly while I’m walking around! BLEND UNTIL EVERYTHING IS SMOOTH & ENJOY! I’m also really loving these brownies, which really are not brownies at all and honestly the recipe sounds gross, but I tried them and I’m obsessed! They are really rich and decadent, and remind me of a brownie more than a blondie. You can get the recipe here! For dinners some of my favorite things are salads with grilled chicken & avocado, tacos with lean ground beef and low carb tortillas (mission low carb tortillas are my fave) and tuna salad with pita bread! I can only hope to look as adorable as you do when I’m pregnant. Will you please share where your mirror, glass vase, and flowers came from? Thank you! I’m obsessed with that name!!! Seriously so perfect and it goes perfectly with Blaire and Brooklyn!!! Awww!!! !